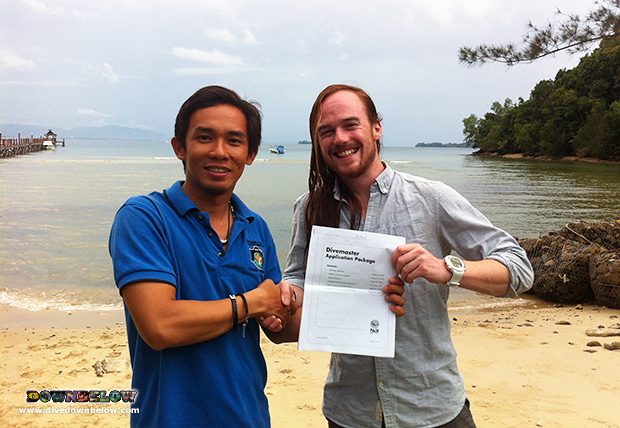 Opportunities after qualifying as a PADI Divemaster. Home/Courses, Divemaster, News, Professional Diving Internships/Opportunities after qualifying as a PADI Divemaster. After qualifying as a PADI Divemaster, our interns will find many opportunities in the dive industry, but the most popular route is continuing their professional dive education to become an Instructor! Go PRO internship candidate Mike Jones, certifies as PADI Divemaster under the tutelage and patient mentorship of one of our elite PADI IDC Staff Instructors of our Go PRO team, Pablo. For the past month, the two have shared their dive experiences with one another and formed a wonderful new friendship neither will soon forget. Many divers are inspired by their dive educators to become a dive educator themselves, and many of our PADI Divemaster interns continue on to enrol on the PADI Instructor Development Course (IDC)! It’s the next logical step to achieve a fulfilling career in dive instruction and live the ‘dive lifestyle’ full-time! Mike’s plans will be to explore further the beautiful island of Borneo and the surrounding South East Asian archipelago, and any diving he experiences (in either a professional or recreational capacity) is valuable to his future dive career! For more information on how to live the ‘dive lifestyle’ as Mike will do as a PADI Divemaster, contact our HQ in Kota Kinabalu, Sabah. One of our Go PRO advisors will arrange one of our highly successful Go PRO internship programs to combine your professional dive training. By Joanne Swann|2015-01-07T13:34:06+08:00January 8th, 2015|Courses, Divemaster, News, Professional Diving Internships|Comments Off on Opportunities after qualifying as a PADI Divemaster.